Dive Clubs and Groups are always welcome! We are a PADI 5 Star Gold Palm IDC Resort and we would be happy to accommodate and dive with your dive club here in Tenerife. Dive Clubs will always be able to dive together, but depending on group size not necesarily seperate to other clients. 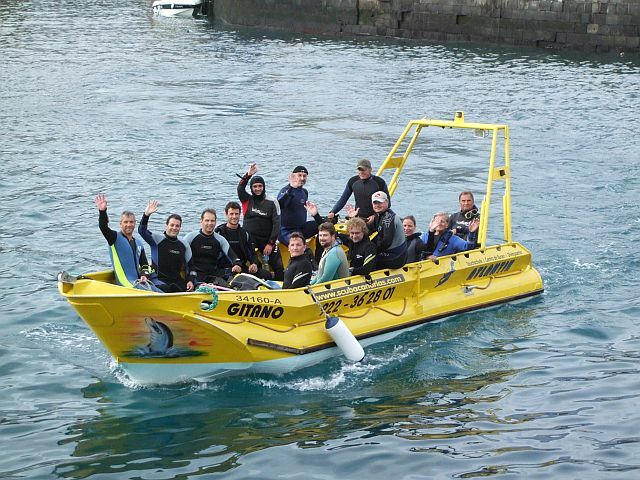 In case of too many "normal" divers and a huge dive club we will organise several diving excursions at different hours. A great advantage of the island of Tenerife is the fact that there is diving possible all year round. If the weather conditions do not allow diving on one side of the island we can reach calm dive sites on the other side in just 30 - 45 minutes. This is why dive clubs who came just for diving all week long will not have to skip any diving day due to weather conditions. Another advantage of Tenerife is the multitude of possible activities, parks, sports, excursions and entertainment also for non-divers. Bring your family, friends and colleagues even if they don't dive. There is plenty of activity and fun for those who do not like scuba diving like swimming, surfing, paragliding, mountain biking, hiking, climbing, excursions, parks and zoos like "Loro Parque", "Siam Park", "Safari Park", and much more. Al a dive group you will dive at the lowest possible rate but you'll have to be diving with at least the minimum number of divers for the group rate. If the number of divers in the water is less, you will pay the full normal price! So talk to your group members and think what is best for you, either an individual package of dives for each diver or our group offer. If several members of your family are divers or if you travel with some diver friends, you may book a family package and get a better price for all dives together than in any single person package. The family package includes 18 dives for at least 3 persons diving together. If you travel with a bigger group or you come with your dive club to Tenerife you might want to book a group package. A Dive group is defined as a group of minimum 6 divers in the water. This package is designed specially for dive clubs. One Instructor who organise the club vacation here with us will dive for free if you bring at least 10 paying divers. 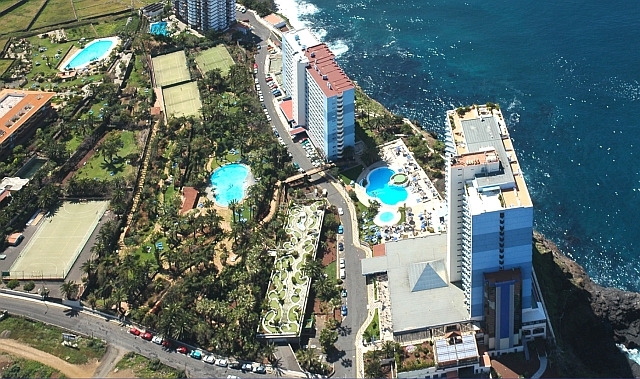 The Hotel MARITIM will offer you FREE ACCOMMODATION for a group of at least 15 paying divers. We assume that all group members have their own equipment. In case something is missing you may hire equipment from us at the normal rates for equipment hire. However, we can not provide rental equipment available for a complete group of a diving club. Please let us know in advance the necessary rental equipment. If an instructor is travelling with the goup and wants to do soime course dives with his students, this will be made possible. For all dives the conditions above apply. For course dives done by our instructors we will charge the normal course prices from our course price list without any exception. We have dive sites for beginers available. For theory you may use our teaching room for free at times where we do not need it ourselfs. All PADI teaching materials, computer, internet and beamer are available. If you as instructor organise the group trip, please read this! From experience we know that the group size is often less at arrival than originally requested. If you are planning a group trip please keep in mind that some group members may get ill or have to cancel for other reason at short notice. The offers made for accommodation and diving have been made on the base of the requested number of divers. Should you arrive with less divers than originally requested the price for accommodation and diving may be higher than offered! Our tip: get a payment from all participants at the earliest time possible and hand out cancellation conditions in written form! If you finished your Minigroup or Group package, you'll get any additional dives automatically at the same rate as in the package! You do not need to get a whole new package. BUT you must still have the minimum number of divers in the water. As a family or dive group you may also participate in one of our special dives like NIGHT DIVING, MOUNTAIN OF FISHES, TUNNEL or PLANE WRECK. For these dives we will charge the normal supplement to each diver as marked in the supplement list below. The best accommodation for groups is always the Hotel MARITIM. We can offer you double bed rooms or apartments for 4 persons at very reasonable prices. Just ask us, we will offer you all options depending on group size and travel period. We are not a travel agency, and we can't offer any flights. If you have booked a package holiday for your group in another hotel or apartment, we can pick you up from your accommodation and bring you back after diving. This service is available exclusively within the city limits of Puerto de la Cruz, and the Hotel "Panoramica Garden" in Los Realejos. We do not pick up from other villages! For groups we charge a single fee of 5€ per person for this service valid for your complete stay.